1. Cover grill rack with foil. Prepare outdoor grill for direct grilling over medium heat. Spray large skillet with nonstick cooking spray. Cook jalapeño and onion over medium heat 4 minutes, stirring occasionally. Add chicken, salsa and cumin, and cook 6 to 8 minutes longer or until heated through. Remove skillet from heat; stir in lime juice. 2. Spray foil-lined grill rack with nonstick cooking spray. Place 4 tortillas in single layer on foil: sprinkle each tortilla with 6 tablespoons cheese. 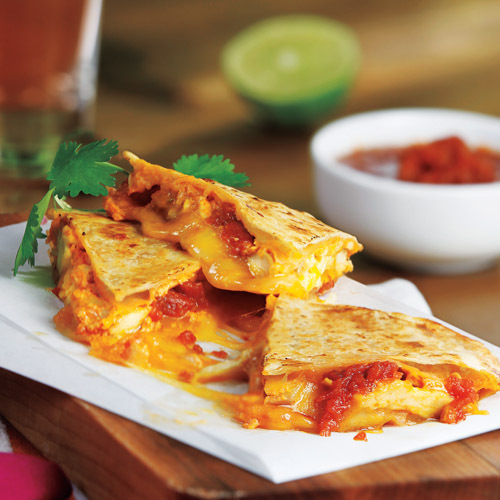 Evenly divide chicken mixture over cheese, then top each with 6 tablespoons remaining cheese and remaining 4 tortillas. Lightly spray tops with nonstick cooking spray. Cover and cook 8 to 10 minutes or until tops are lightly browned and cheese melts, turning once halfway through cooking. 3. Cut quesadillas into wedges and serve with sour cream, if desired.